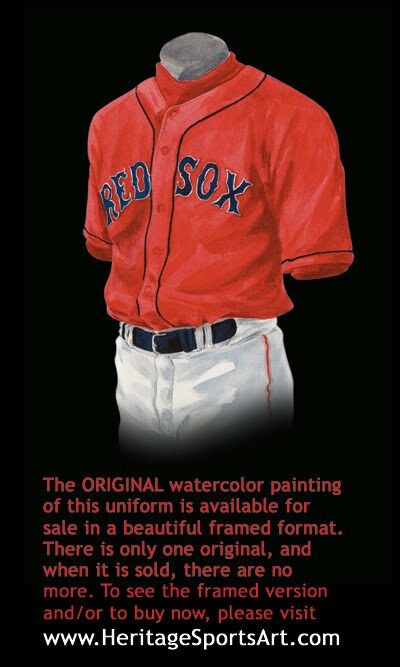 Please click on the evolution of the Red Sox uniform poster above for a close-up version of the poster. The descriptions below give you some insight and background about the uniforms and/or eras depicted in the poster. Baseball in Boston in the early 1900’s was confusing - Boston had both an American League team and a National League team, and the team names kept changing while at the same time their uniforms looked alike. Boston’s National League team, established in 1876, was the Boston Doves and later became the Boston Braves, the Milwaukee Braves and now the Atlanta Braves. As for the Red Sox, they were established in 1901 with the formation of the American League and were first known as the Boston Americans. 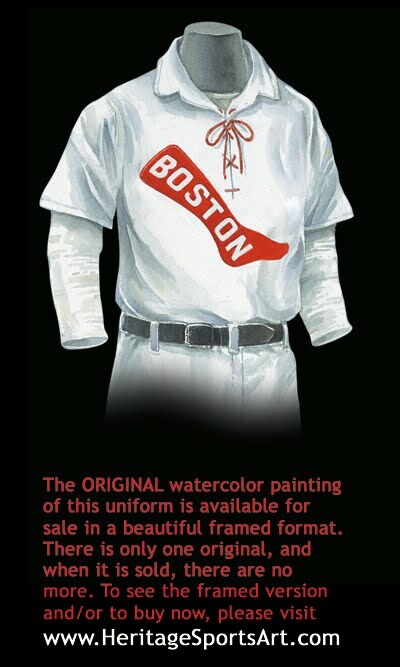 They then became the Red Sox in 1908. It has been published and reported again and again that the Red Sox were at one time or another also called the Puritans, the Pilgrims and the Beaneaters, but this myth has been debunked in an extremely well researched and documented article by Bill Nowlin entitled “The Boston Pilgrims Never Existed”. This article can be found at www.baseball-almanac.com/articles/boston_pilgrims_story.shtml . 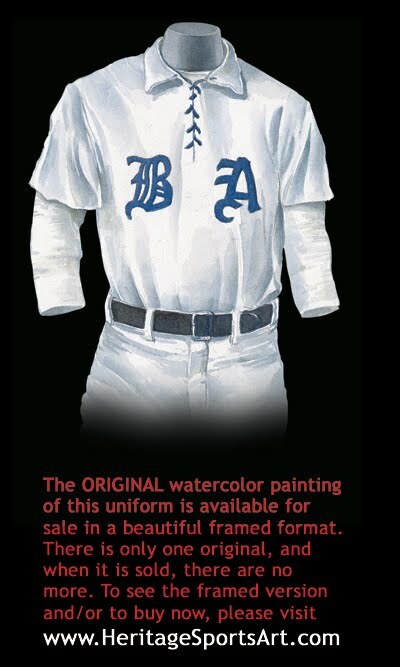 The lettering style on this jersey began in 1901 - the first year of the American League. Notice the color, blue not red. 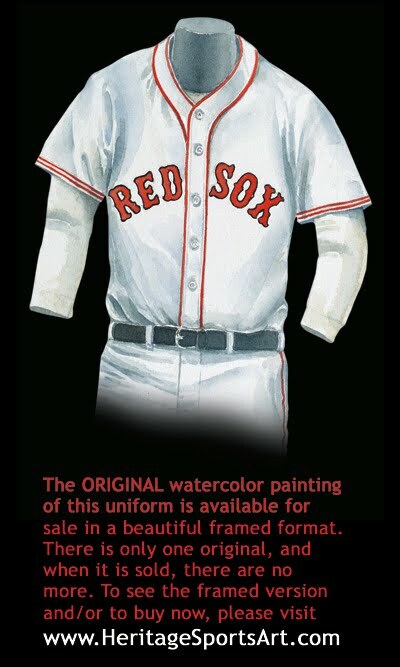 Notice also the laced neck - Boston was one of the only teams at the time to have a laced neck - it was mostly unheard of in baseball in the early 1900’s. This jersey shows the 1902 jersey. 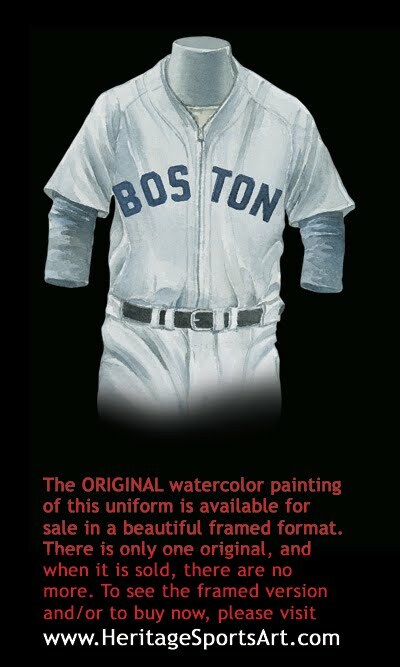 Originally the research team here at Maple Leaf Productions believed Boston wore this uniform in 1902 and 1903 largely because the 1903 World Series team photo collages showed the majority of players wearing this uniform, but upon closer study it seems apparent that the 1903 team collages used some pictures from the 1902 season when this jersey was worn. The following year, 1903, Boston plays in the first ever “World Series” against the Pittsburgh Pirates, and the upstart American League Red Sox upset the National League champs. The Red Sox won the Pennant again the next year, but due to animosity (and some say jealousy) between the New York Giants (the National League Pennant winners) and the Red Sox, the World Series was not played in 1904. The Boston Americans home uniform was white with red as their trim color, socks included. As a result the Bostonians were quick to adopt Red Stockings or Red Sox as their nickname. 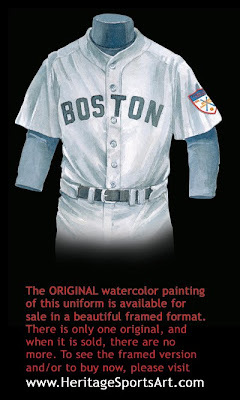 This is the first pictorial reference to the team nickname on a Major League jersey. This was Babe Ruth’s first full season with the Red Sox. 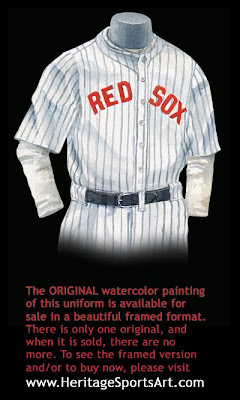 The Sox wore this un-lettered home jersey for six years, until the 1921 season, when they added pin stripes. In addition to their first World Series victory in 1903, they won it all in 1912, and again in 1915. Every time they made it to the Series, they won it. This year would mark the Red Sox fourth season at Fenway Park, where they still play ball today. The Red Sox’ future looked very bright, especially with a young pitching (and hitting) phenom George Herman Ruth leading the way. 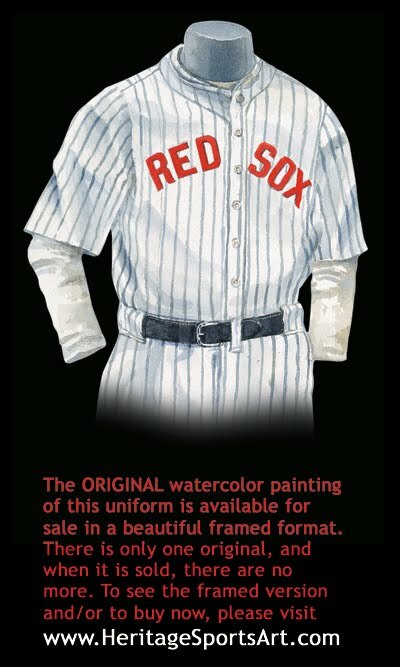 While on the road, the Sox wore this tight pin striped uniform with “Red Sox” stitched on the front. They had an amazing start, winning five World Championships in their first 18 seasons. After their third Series win in 1915, they celebrated two more in 1916, and again this season - 1918. Who could have foreseen that the Sox wouldn’t win another World Series for the next 80+ years? Some fans believe this run of bad luck is the Curse Of The Bambino. As the story goes, Harry Frazee, then owner of the Red Sox, was desperate for money to keep producing Broadway plays. Babe Ruth was thus sold to the Yankees prior to the 1920 season for $125,000 cash and a $300,000 loan to Frazee. So legend has it that because they sold one of the greatest ball players ever, the gods of baseball have frowned upon the Red Sox ever since. The Sox adopted a wider pin striping for their road uniforms. These years would be termed the “forgettable twenties”, with the fans only dreaming of what could have been, if the likes of Babe Ruth (traded to the Yankees in 1920) and Tris Speaker (traded to Cleveland in 1916) were still with the Sox. 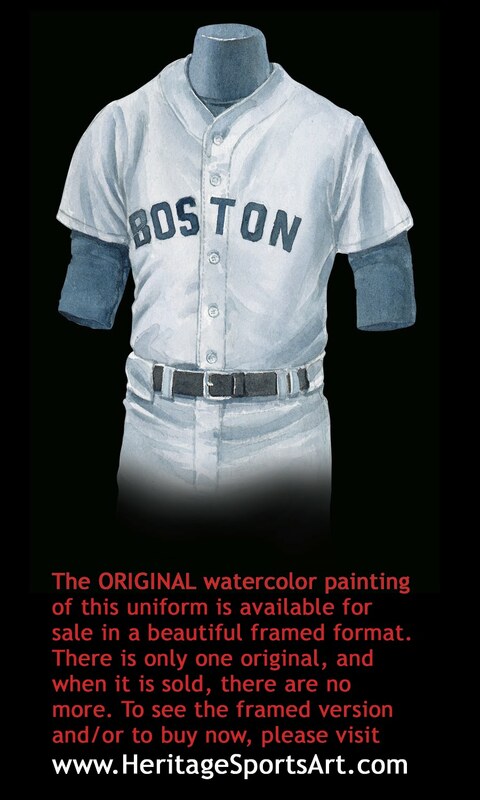 In this home uniform you can start to see similarities between this jersey and today’s Sox jersey. This was the year that the pin stripes were removed. There is no piping around the collar and buttons at this stage, although that gets added soon. Notice the red stockings on the left sleeve - these in 1931 and 1932 only. Compare this home jersey to the 1999 jersey. 50+ years and not much has changed! One small difference is the double red piping that goes around the top of the collar. During this time period, while America is at war, the question is raised, should able-bodied athletes of baseball be fighting for their country overseas? The commissioner of Baseball and the President of the United States discuss the game’s role in the war. Both agree that baseball is too important to the people. It will boost the morale of the entire country, and take their minds off of the war effort for a short time. Wartime sleeve patches were worn by all levels of professional baseball teams. The Health patch was only worn for the 1942 season, part of a health and fitness awareness campaign. The Stars and Stripes patch, as shown on the left sleeve of this home jersey, was worn from 1943 to1945. Ted Williams, one of the best that ever played in a Red Sox uniform, batted .406 in 1941, only his third year in the majors, and was the last major leaguer to hit over .400 in a season. The next year he won the Triple Crown, with a .356 average, 36 home runs, and 137 RBI. Williams then joined the US Marine Corps after the 1942 season, and returned to play ball in 1946. Stats fans wonder what more he could have accomplished if he hadn’t missed those 3 years in the prime of his career. 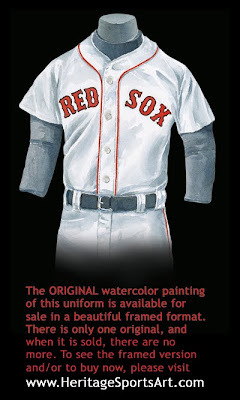 The Red Sox road uniforms have remained pretty much the same from 1948 to present. That being said, notice that they used a zipper instead of buttons at this time. When you go almost 60 years with almost no change in jersey style, the addition of a zipper instead of buttons becomes a big deal! During the 40’s, 50’s and 60’s many teams used zippered jerseys instead of the more traditional button front jerseys, while a handful of teams wore them well into the 70’s and even the 80’s. The Reds, Yankees and A’s were the three pre-1977 major league teams that never wore zippers. The 1937 Cubs were the first team to wear a zippered jersey, and as far we can tell the 1988 Phillies were the last to wear one. By the end of the 1948 regular season, Boston had finished atop the American League. The only problem was, so had Cleveland. With identical 96-58 records, a one game playoff was scheduled for the first time in Major League history. The Indians prevailed 8 to 3 and thus advanced to the World Series. The Indians then faced Boston (the Braves that is), and beat them four games to two. This Red Sox road uniform shows that buttons have long since replaced the zipper. The patch on the left sleeve commemorates the American League’s Golden Anniversary, 1901-1951. 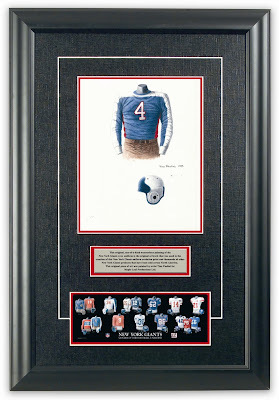 The home uniform is very similar to that of the 1942 jersey, with one exception. Notice the red piping on the sleeves. In one of the closest races ever for the American League Pennant, the Sox triumph over the Detroit Tigers and Minnesota Twins by one game. The team is lead by the talent of MVP and Triple Crown winner Carl Yastrzemski (the last Triple Crown winner) and Cy Young Award recipient Jim Lomborg. They went on to the World Series to face the St. Louis Cardinals. The Cards’ Bob Gibson went 13 & 7 during the season, but saved his best for last. Winning games one, four and seven, and only giving up three runs in all three games combined, and even hitting a home run himself in game seven, Gibson almost single handedly clinches the Series for the Cards. The curse strikes again. This home jersey is of a double-knit style that most of the other teams succumbed to as well during the 70’s and early 80’s. It was a pullover style, made of synthetic material. The pants were called “Sans-a-Belt”’s because the elastic material of the waistline eliminated the need for a belt. The patch promotes Massachusetts’ Bicentennial. The 1975 Red Sox won the Pennant, by beating the 3-time defending Oakland A’s in three straight games. They went on to face Cincinnati’s “Big Red Machine” in what has been remembered as the best World Series ever played. With the Sox facing a long winter ahead of them with one more loss, they went into Game 6 down three games to two. Boston’s Fenway Park, October 21st, 1975 has gone down in baseball history simply as “Game 6”. Boston went up by 3 in the 1st, only to have Cinci come back with 3 of their own in the 5th. The Reds then added another 2 in the 7th, and 1 more in the top of the 8th. The bottom of the 8th, 6-3 Cincinnati, two men on as Bernie Carbo steps up to pinch-hit for the Sox. He sends a pitch into the center field seats for a 3 run homer. Tie game. The Sox are back. The Sox then fill the bases in the bottom of the 9th with nobody out, and fail to score. Uh oh, remember the curse? Bottom of the 12th, Carlton Fisk is the first man up for Boston. He hammers the first offering down the left-field line towards the Green Monster. Time slows for an instant. Is it fair or foul? Fisk raises his arms, and wills the ball fair. The fans hold their breath as the ball rings off the foul pole. Fisk jumps into the air and all at Fenway follow suit. Sox win 7 to 6, and the series is tied at 3 going into game 7. What curse? The next day, again at Fenway, the Sox go up 3 to 0, only to have the Reds come back and tie the game. Going into the 9th with two out, the Reds Joe Morgan hits a single, driving in the go ahead run. The Red Sox fail to score in the bottom of the 9th, and the Reds win the game and the Series 4 to 3. Cursed!!! 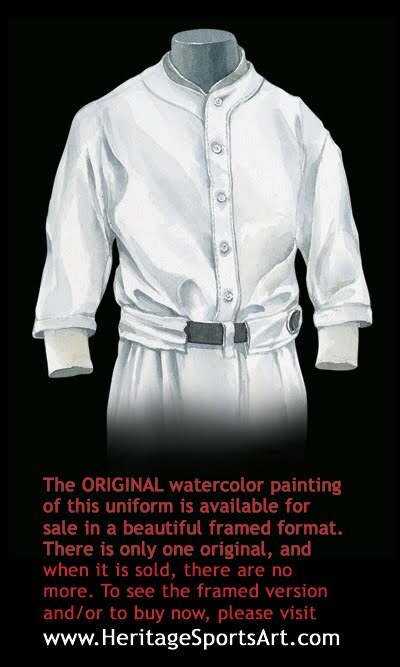 By 1986 the home and road uniforms have lost the elasticized waistband and gone back to the more traditional belt. 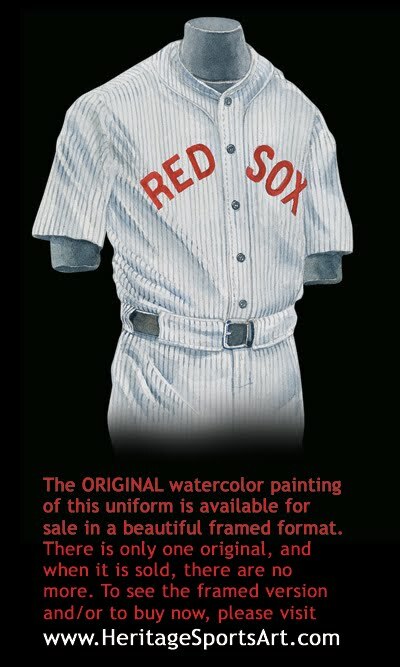 Both of these are classic Red Sox uniforms, and still look the same to this day - and much the same as in the 40’s. In a year that features Wade Boggs winning a second straight batting title (his third in four years), Roger Clemens taking both the MVP and the Cy Young Awards, and outfield greats Jim Rice and Dwight Evans, Boston faced the California Angels for the Pennant, and the Sox prevailed in seven games. Clemens shut the Angels down to take the final game, and move on to another fabled World Series, this time against the National League Champion New York Mets. A cocky group of guys filled the Mets lineup, but they were humbled after losing the first two games in front of their own fans. The Sox then lost the next two, tying the series at 2-2. After winning game one, Bruce Hurst was asked to pitch again in game five for the Sox. Another win, and Boston was one win away from their first title since 1918. Another “Game 6”, this time in New York. The game is tied going into extra innings, and the Sox take the lead. They’re up 5-3 going into the bottom of the 10th. Could this be it? Two out, nobody on for the Mets. Has the curse been lifted? Down to their last strike, not once, but twice, the Mets get singles from Gary Carter, Kevin Mitchell, and Ray Knight. Carter scores making it 5-4, but the Red Sox still lead. Sox pitcher Bob Stanley uncorks a wild pitch, sending Mitchell home, and Knight to third. It’s now tied at 5. Now the Sox go from thinking about winning the World Series to; “let’s not lose this game!” Mookie Wilson taps a routine grounder to first, where Bill Buckner waits to make the final out, and send the game to the 11th. The ball bounces toward Buckner, and just before it reaches him, it flattens out, and doesn’t take that last bounce as it would 99 times out of 100. The ball rolls right under his glove and into shallow right field. Knight scores, and the game goes to New York. Another Game 6 for the ages. Game 7, again in New York, starts out well for the Sox, who go up 3-0 in the 2nd. This lead lasts until the 6th when the Mets score 3 of their own, tying the score. They scored another 3 in the 7th to go ahead of the Sox for good, eventually winning the game 8 to 5. Another World Series defeat for the beloved Red Sox. The curse lives on. 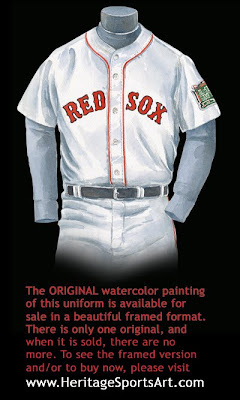 The home jersey is still strikingly similar to the ones worn since the ‘40’s - you can’t improve a classic! The patch commemorates the 1999 all-star game, played at Fenway Park for the first time since 1961. Ted Williams makes an appearance, and receives the warmest of receptions, including a touching welcome from all of the current All Stars, who gathered around Teddy Baseball to shake hands with a living legend. The 1999 Sox feature two modern day superstars - Pedro Martinez, who has won the Cy Young Award three times (two with the Sox in ’99 and 2000), and shortstop Nomar Garciaparra (who stormed onto the American League scene in 1997 and won the Rookie of the Year Award). And the Red Sox make the playoffs as a wildcard entry, upsetting the favored Indians before succumbing to the Yankees in the American League Championship Series. In 2003 the Red Sox fielded a stacked lineup that was a nightmare for opposing pitchers. With the likes of new acquisitions: Kevin Millar, Bill Mueller, David Ortiz and veteran LF Manny Ramirez, the Bosox the possessed the most powerful lineup in baseball. They led the majors in several key offensive categories including RBI, 932 (the 1936 Yankees own the AL record with 995) and Batting Average .289 (the 1921 Detroit Tigers own the all-time AL record, .316.). On the mound Pedro Martinez (20-4, 2.26 ERA), Derek Lowe (21-8 2.58 ERA) and knuckle-baller Tim Wakefield (11-5, 2.81ERA) anchored a very solid pitching rotation. Once again it was a battle of the two AL East titans, the Yankees and the Red Sox. The two teams pounded each other all season with neither team showing any signs of real dominance as the New Yorkers took 10 of 19 games. In the postseason the Yanks and Bosox disposed of the Twins and A’s respectively in the ALDS. In the ALCS the teams met again a split the first six games. Game Seven was played in Yankee Stadium and it provided all the drama playoff baseball should. Pedro Martinez pitched well taking a 5-2 lead into the 8th inning, but he couldn’t hold it and surrendered the tying runs. Sox skipper, Grady Little was later vilified by the Red Sox Nation for not pulling Martinez out of the game sooner. In the 11th inning Tim Wakefield would come on to face Yankees 3B Aaron Boone. Boone crushed the first pitch he saw over the left field wall for a game-winning, walk-off home run and a 6-5 Yankees win. 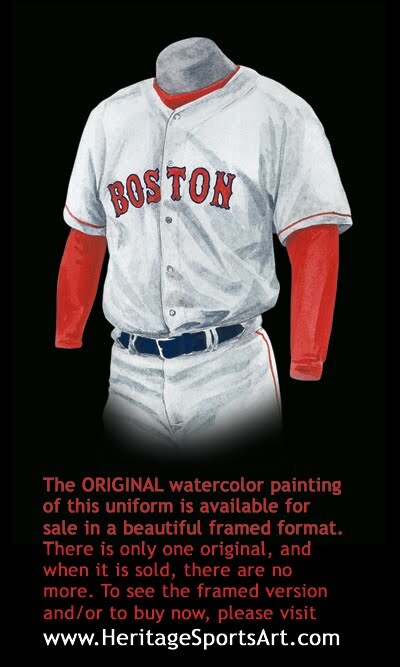 Sartorially the Red Sox introduced an all-red 3rd jersey to their wardrobe – a striking first for the Red Sox. 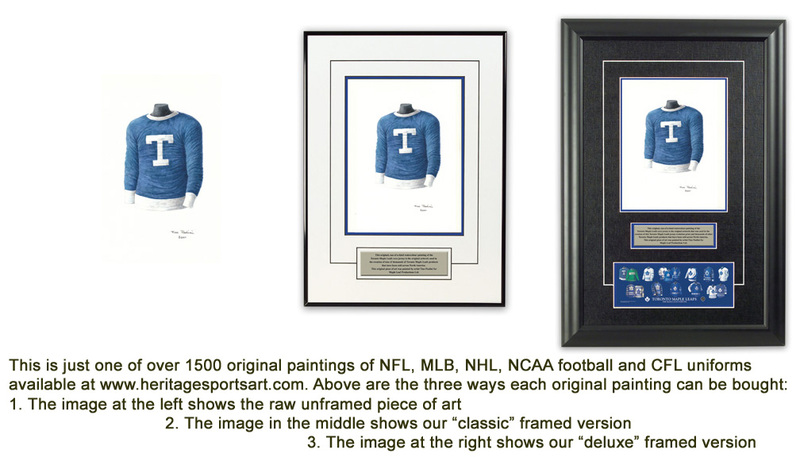 A 3rd jersey is a concept that became commonplace in Major League Baseball by the mid 90’s. Most 3rd jerseys are worn occasionally at home as well as on the road, giving a team a third option as to what uniform to wear. And of course, the addition of a third jersey adds to the options fans can buy, thereby increasing apparel revenues and ultimately benefiting the team. More recently, teams have begun adding 4th and even 5th jerseys to their roster of uniform possibilities. This third jersey, worn for occasional home games, is red with navy blue lettering and black trim. At long last, next year has arrived! The curse of the Bambino has been lifted! After 86 years, long-suffering Red Sox fans can now die in peace, as their beloved Red Sox are 2004 World Series Champions. The battle for baseball supremacy began in the off season when the Red Sox and Yankees both looked to bolster their offensive attacks by acquiring AL MVP Alex Rodriguez, who no longer fit into the Texas Rangers plans. The Yankees eventually won that battle when Yankees GM Brian Cashman made the deal with the Rangers. So, the Red Sox countered with the acquisition of veteran RHP Curt Schilling from the Arizona Diamondbacks. During the regular season the Sox and Yanks met 19 times with Boston winning the series 11-8. You could tell this long-time rivalry was hitting its peak as every game between these two clubs felt like a playoff game, especially a midseason game at Fenway, when the Sox’ Bronson Arroyo hit the Yankees’ Rodriguez with a pitch that ignited a bench-clearing brawl. The two teams advanced to the playoffs. The Yankees won the AL East for the 7th straight time with a 101-67 record. The Bosox claimed the AL Wild Card berth with a 95-67 record. Both teams dispatched their ALDS opponents; the Yanks beat the Twins 3 games to 1, the Bosox swept the Angels in three games. Once again their paths would cross in the ALCS. The Yankees won the first three games of the series and no team in baseball history has battled back from a 3-0 deficit in the playoffs. Only an idiot would think they could come back after falling behind three games to none. But after nicknaming themselves as “a bunch of idiots”, the Sox were up for the task. After trailing most of game 4, the Sox tied the game and then won it on a 12th inning homer by David Ortiz, 6-4. Their roll continued as they won Game 5, 5-4 in extra innings and Game 6, 4-2, forcing a seventh and deciding game. The back–to-back losses really seemed to rattle the battle-tested Yankees. Normally when they led going into the final inning they won. P Mariano Rivera was almost automatic coming out of the bullpen to close games. But formally invincible Rivera blew saves in games 4 and 5 leading to extra inning victories for the Sox. 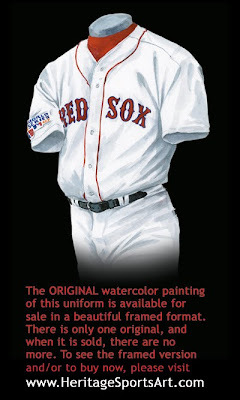 And if that wasn’t inspiration enough, Curt Schilling, who many thought was too injured to participate in the series took the mound with his tendons stitched to his ankle as blood was visible through his sock on a rainy night in the Bronx in Game 6. He was masterful, throwing 6 scoreless innings, allowing just one run in seven innings of work. The Sox then put the hammer down on a stunned Yankees team and won game seven 10-3. It was off to the World Series for the first time since 1986 - and best of all for Red Sox Nation, it was at the expense of the Yankees in unprecedented come-from-behind fashion. After pulling off the most unlikely comeback against the hated NY Yankees the Red Sox seemed to be a team that was not to be denied. Since the American League won the All Star game the Red Sox got ready to host the National League champion St. Louis Cardinals in the World Series. The Cards were a modern-day murderers row with heavy hitters like Albert Pujols, Jim Edmonds and Scott Rolen all finishing the season with over 100 RBI (123,124, 111 respectively) and they added 1997 NL MVP Larry Walker mid-way though the season to their lineup as if they needed more power. This was shaping up to be a classic World Series. The opening game was a see-saw affair that saw the Bean-towners pull off an 11-9 win. In Game 2 Curt Schilling and his surgically repaired foot shut out the Cards for 6 innings as the Bosox took the contest 6-2. The Series shifted to St. Louis for games 3 and 4. But too bad for the Cards the Red Sox were rolling. Playing in front of a packed Busch Stadium, the Red Sox took Game 3, 4-1. Pedro Martinez stymied the Cards throwing 7 shutout innings. Game 4 was more of the same as those daunting St. Louis sluggers were tamed by Derek Lowe who shut them out for 7 innings as well. The end result was a 3-0 win and a four-game sweep for the AL Champs- their first World Series championship since 1918! - And the Series MVP? None other than the biggest “idiot “ of all, fan favourite, Manny Ramirez, who batted .412 in the World Series (he also batted a solid .300 in the ALCS). When the Red Sox won the World Series they were in St. Louis wearing their road uniforms like the one shown here. This road uniform is grey and features the city name written across the chest. 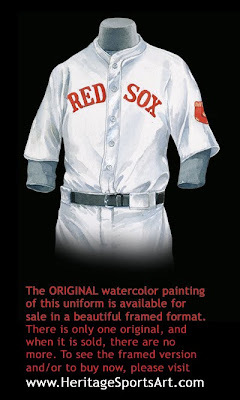 Note also that on this uniform the Red Sox use red lettering, in the “Red Sox”-type font, to spell Boston. 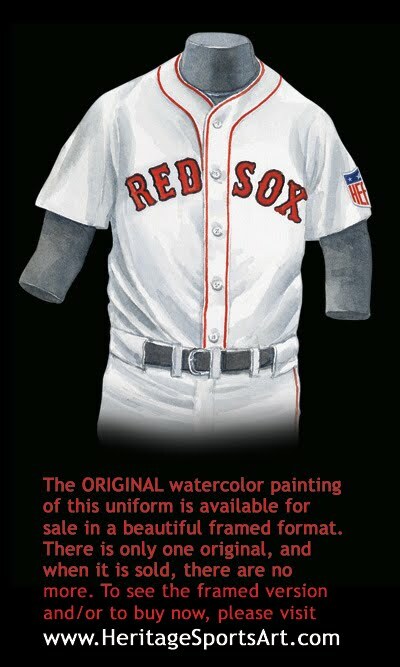 Please note also that the uniform features red accent trim on the sleeves and down the side of the leg. Text not yet written, but the Red Sox did win another World Series! 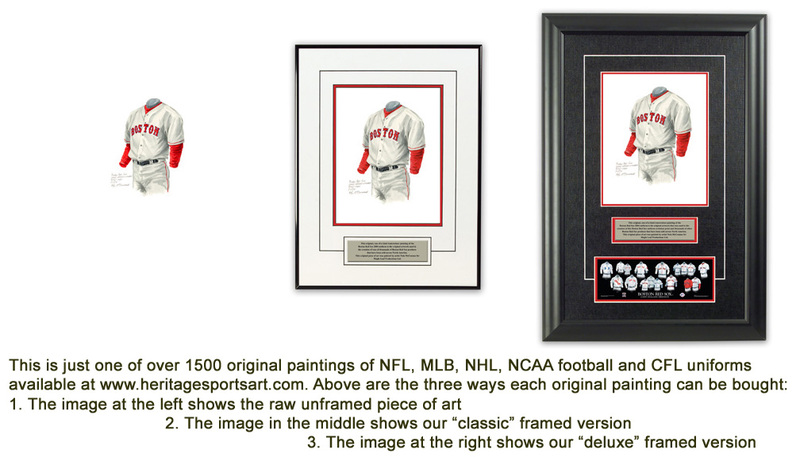 If you love the Boston Red Sox and the history of the Red Sox franchise, you might really love to own an original piece of artwork celebrating the team's historic uniforms as seen in the poster at the top of this blog - you can actually own one of those original pieces of art! There are only 18 pieces of original art available for sale, and when these 18 are sold, that's it, they're all sold out. 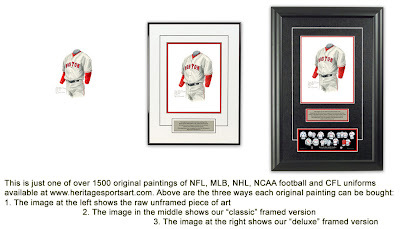 If you would like more information about this great artwork including the three ways you could purchase each piece, please visit our Boston Red Sox YouTube video at www.youtube.com/watch?v=hIMJf3ua0Rw or go directly to the artwork website www.heritagesportsart.com/Boston-Red-Sox-c12/ where you can see and purchase the artwork. And please search my blog archive http://heritagejerseys.blogspot.com/ for other blogs on the history of the Red Sox. Ted Williams was a Marine, not Air Force. Thanks for the note - I've now changed the text.